Healthcare industry generally faces perplexing issues like rising costs, lack of infrastructure, insufficient staff etc. Due to these dominant issues, many health care organizations are now choosing cloud based solutions. 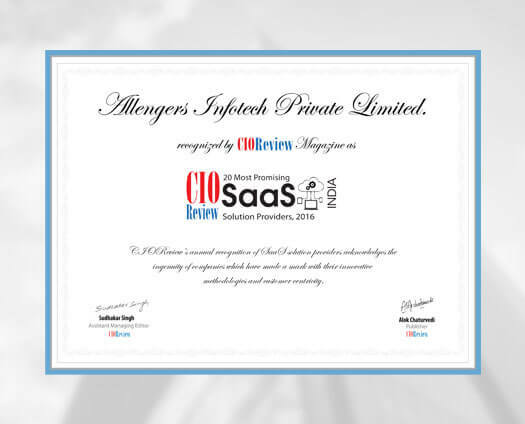 Taking cloud technologies as leverage, Chandigarh headquartered Allengers Infotech, comes into the healthcare scenario with its cloud and onsite solutions for hospitals, clinics, labs and diagnostic centres. Leveraging its thirty years of medical experience, the company ensures to provide smart solutions that help healthcare providers save their time, money and energy while making data easily accessible, standardized and secured. Allengers Infotech offers ‘Clarity’, a Hospital Management System (HMS), to manage the complete medical, financial and administrative data of a healthcare organization and organizing it into meaningful information that helps owners in decision making. The company’s cloud based AllenPACS (Allengers Picture Archiving and Communication System) enables centralized storage (archiving) of medical diagnostic images and videos from different modalities and helps them to be viewed, edited, retrieved and distributed efficiently within the framework of healthcare organization. It’s ALIS (Allengers Laboratory Information Systems) processes, saves and integrates data from all stages of pathology processes and tests, helps medical practitioners & technicians administer varieties of inpatient and outpatient medical tests pertaining to haematology, immunology, microbiology etc. The company understands the requirements of a healthcare organization both from the medical and business angle and has specifically incorporated many features benefiting both. For example when it comes to ALIS, the solution is integrate-able with lab machines that enable automatic entry of test results for each client. Then, its automated SMS feature enables patients to receive their reports via SMS the moment they are generated. The SMS includes a website link along with a unique ID and password for each client to view the actual detailed test report on the organization’s web portal. Hence, time & money is saved, while human error is eliminated. For all its applications, dedicated mobile apps are also there. AllenPACS comes equipped with offsite & offline viewing and reporting features. It has an intuitive interface accessible from anywhere and its inbuilt reporting module with text and voice note options that makes reporting easier. Through integration with HMS, the solution helps in the maintenance of a complete patient medical record for later reference and effective reporting. Additionally, ‘Clarity’ streamlines workflow and boosts efficiency by means of reminders, schedules and automates day to day activities. The product helps to increase revenue by optimized scheduling and SMS reminders, offers online prescription history and reports and provides strict inventory tracking, online doctor visibility and easy appointment booking for local patients through the patient applications. Clarity’s powerful real-time analytics also brings financial and operational data quickly. With “Passion for Innovation” as it motto, Allengers Infotech endeavours to be a frontrunner in unifying and standardizing medical data while uplifting Indian healthcare sector to the level of its international counterparts. With the determination, ideas and brand power, it foresees a future where medical devices interact with software and software interacts through wearables, smart phones and various other daily devices.